Our renovation was mostly completed about a year ago, but finalising all the little bits and pieces seems to take forever. There’s always something you can’t find or finish off, and finding the time in our increasingly busy lives seems the greatest challenge. Still, the kids’ bathroom has turned out to be a favourite room. Although they still use our bathroom more than theirs! I’d swap any day! This bathroom is upstairs facing south-east, and had a rather dreary and dated palette of buttercup beige with forest green. With horrid cream bathroom accessories, a green bench top and, well it speaks for itself I think! I wanted the bathroom bright and fresh, with lots of white and touches of aqua. I didn’t want a juvenile looking bathroom that would date, but still would appeal to both the kids and adult visitors alike. The vanity, bath, bath surround, shower and hob were all removed. I didn’t change the configuration of the bathroom as I didn’t want the plumbing to have to be relocated. As it was we had to replace the ceiling, floor and walls so it was a more involved and costly process than first thought. Isn’t it always the way! It never ceases to amaze me when you renovate and deconstruct your house, how flimsy and simply constructed it seems to be. Just a bunch of pieces of timber, a few nails, wires and some gyprock, but once it’s all gussied up it looks strong, solid and fab. We were able to retain the existing floor, although we added underfloor heating. The walls were clad in Villaboard lining, which is ideal for wet and high traffic areas. Only catch is it’s impossible to nail into as it is made from fibre cement, so you have to drill into it when you want to hang things. The ceiling was replaced with gyprock, and although I lined the girls’ bathroom ceiling with v-joint, as tempting as it was, knowing I was paneling the walls here I didn’t want to overdo it. So kept it simple. Removing the walls and ceiling of course meant new cornices, architraves and skirtings as well. Has I have a traditional house with classic traditional interiors and decor, I prefer not to tile the walls of my bathrooms except around the shower. In this style of bathroom I don’t feel it’s necessary and it makes it feel a little clinical and cold to me. 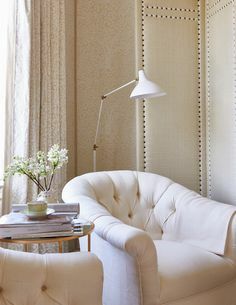 I prefer painted, panelled or wallpapered walls. Modern bathrooms are different, but it’s also a cost saving. So I keep the tiling only in the wet areas where water makes direct and regular contact. The odd splash from a bath or basin doesn’t bother me either. As long as the room is well ventilated you can have the right timber trim anywhere you like. The appropriate sealing and painting is of course important too. The very heavy bath sat on the landing in wait for some time. I used a plain white subway for the shower recess, given the plentiful decorative elements everywhere else, I kept it simple and the cost down. It was a challenge matching all the white in the space though, as the bath, tiles, paint all had to be the same tone of white. I always use the same toilet in every bathroom renovation. It’s simple and classic and just blends in. I don’t want to make a statement with a loo. I had always wanted to use this beautiful aqua and white trellis wallpaper, since falling in love with it years ago. I never got to use it in our former house in Sydney, so made sure of it here. It’s perfect for this bathroom. I don’t have an issue with wallpaper in a bathroom either (I have it in three of ours and the laundry), as long as water won’t come into direct regular contact and it’s well ventilated. The odd splash isn’t a bother. I have a window and extractor fan in here, and the paper is above any splash zone anyway. The vanity was custom-made and I copied a design from Pottery Barn US which was perfect for the kids. They only needed one sink and I prefer as much bench space as possible anyway. The shelf below is great for baskets, towels and toiletries. The bench top is Caesarstone Nougat which has a tiny grey fleck to pick up the grey in the marble floor tile. I love classic tapware and particularly lovely those with the shepherd’s crook design and bamboo inspired detailing. I have had mixed experience with tapware over the years, including some big mistakes bringing it in from the US, so I now just stick with local product. The range of elegant, classic tapware in Australia is improving all the time and many more affordable and pretty designs are now available. I love the look of polished nickel but for a kids’ bathroom polished chrome was just fine. I don’t like big sinks as I think they are unnecessary and often ugly, and you only generally use them for brushing teeth and very occasionally filling up to wash something. So I don’t like to waste bench space with a giant hole in the middle. Particularly as stone is expensive and it seems a waste to then cut it out. This basin was petite, shallow and in proportion to the vanity. The profile on the end panels and drawers of the vanity is the same as the kitchen, a design I found at a kitchen showroom in LA and tweaked. It’s something I use again and again as it’s the prefect profile for my style and taste. The knobs were left over from the kitchen. 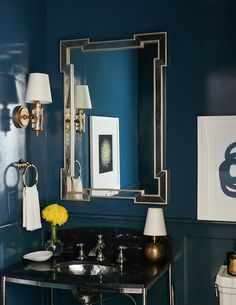 These chrome walls scones from Pottery Barn US are something I have used before as they are a well priced, classic, simple design which I find works perfectly on either side of a bathroom mirror and not too fancy for kids. I still use MyUS.com for my third party shipping as I have found it reasonably priced and fast. I prefer to use semi-frameless showers in classic bathrooms like this. Not only because I think they suit the style better than frameless but they are less expensive and every saving counts when you consider a standard bathroom reno costs about $10-15k. I also only tile to the height of the frame. I also used a border tile to frame the shower recess and keep a barrier between the wallpaper and wet area. The oval shaped pivot mirror is a classic American look I love and I had my eye on a couple from Pottery Barn US and Restoration Hardware. But in the end found this perfect match at Early Settler in Campbelltown. I’m all for getting the look with cheaper and locally sourced products. Then weirdly enough when I unpacked the mirror from the Early Settler box, it had a Pottery Barn sticker on the back and installation instructions! So who knows how Early Settler got to have stock of Pottery Barn US mirrors. But I was rather stoked I ended up with the mirror I wanted, by some odd twist of fate. Again I don’t have a concern about the paneling on the wall near the bath. The kids don’t splash water that much, and it’s sealed and well painted. If it gets wet I simply wipe it dry. The same goes for the timber skirting. Unless the bathroom flooded and the skirting sat in water for hours on end, I hardly think it would cause a problem. We used Western Red Cedar which is much better for moist areas. I wouldn’t use pine or MDF. James Hardie has some perfect products for bathroom applications if you like this look, or want to do something like horizontal shiplap which is lovely. Finding affordable attractive, classic, pretty artwork for anywhere in the house is a tricky prospect, particularly for a kids’ bathroom. Again I didn’t want anything too juvenile or cute. These prints I found online at Etsy a few years ago, they are only small but the colour was right and I had used them in the kids’ bathroom in Sydney. The key to making them look so much more fancy was the beautiful bevelled-edge mirrored frames I bought from West Elm. They make anything look a million bucks. I also added an aqua striped ribbon around the print to outline the artwork and separate it from the white mount. The bath shape is one I have admired and coveted for years in American homes. I found this fabulous one in Melbourne and had it shipped up. It’s very classic and elegant for a freestanding bath which can be typically very modern, and often hugely expensive. This was perfect for the space. Again because of the decorative detail everywhere else in the room, I chose a simple 30×30 Calcutta honed marble tile. I do adore marble mosaics, but we have such a limited range here and they are fiendishly expensive. So for the kids I kept it simple. How cute is this metal bath basket I found at Pottery Barn US. Perfect for loo paper and hand towels. 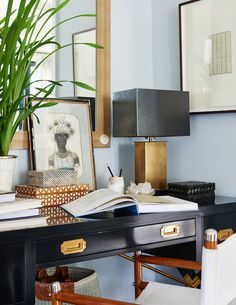 When it comes time to style rooms, I always look to Pinterest for ideas and inspiration. It’s the most amazing source and I almost always find what I’m looking for. What we did before Pinterest, I can’t imagine! This pretty liquid soap from Williams-Sonoma was the perfect colour match, but it’s expensive so we use it sparingly! The cheap one from Woolies stays in the drawer! These pretty fish paintings we bought ready framed many years ago at Signature on Hastings in Noosa, but hadn’t been able to find the right place for them until now. I love them in here, and although I was going to reframe them, I think the timber actually works in this room. It needed something organic, for contrast and to make the room feel less polished. I matched it to the wicker tissue box so it tied in with something. Despite all the accessories being chrome in the bathroom, you don’t have to match the door hardware. All the handles upstairs are black so it made sense for the bathroom door to be the same. I love the touch of black as contrast anyway. The brand Tradware, I used here I would NOT recommend. I have them throughout the house and while the design is lovely, I have had many problems with them, both the colour, finish, wear and function. It’s the first time I have used this brand and I won’t again. Finding good quality, affordable, classic door hardware in Australia is another challenge. Hope you enjoyed the tour and found some helpful information and ideas, as well as inspiration. I am working on the other bathroom posts slowly, it takes about two days or more to style, photograph and write each one, and will share them in the coming weeks. Don’t forget if you ‘d like to book a 2 hr one-off consultation here in Bowral, for May or June, please email me for available dates. Love this bathroom! We are building at the moment and I am finding it difficult to buy wall sconces on Australia. I have my eye on some from Pottery Barn but am worried they will need to be rewired for use here? Have you ever had a problem with getting them installed? I didn’t have these rewired nor most of the lights in our house which are from the US. I have had them rewired before and wasted a lot of money doing it when it wasn’t really, necessary but I was given the wrong advice. It depends on your electrician sometimes too. PS The bulbs are often the tricky party as they use tiny Edison screw bulbs that can be hard to find. Recollections/Early Settler do have some lights, try Interiors Online or if you’re having real trouble let me know what you’re after and I can offer you some ideas. This is so fresh and inviting and, as ever, love your attention to detail. I’m about to renovate a shower room so yet again, you have inspired me! I would love to know what the fabric/wallpaper pattern is that you have used as your background on the site … when you have a moment, please! I can’t remember where but it was from a photo agency website and I liked it because it looked like the wallpaper. Absolutely beautiful Mel.For Cathy, please tell her to look in Recollections. I had trouble finding lights for my ensuite. I ended up with some from Beacon lighting, which they told me were not suitable for a bathroom. However, we always have the fan on, and they were put on the wall with the glass domes hanging down, and they have been fine for thee last 3 years, and look lovely. Also, they did not cost an arm and a leg! Thanks for the great blog and design tips on how to get that Hampton’s Style in Australia! I have been trying to source some dark door handles and wondered what you thought of Early Settler? The Victorian Lever on Rose or the Milton Lever on Rose handles in dark bronze are about as close as I think I can get to the classic hamptons style I would like to create. I have to replace the brass standard round handles in our 20 year old home, so wanted round ones base plates for ease. I also love the lighting for bathrooms from Lowe’s in the US. But have wondered about rewiring – so I read the above posts with interest. Early Settler are a good option for door and bathroom hardware, as is Schots in Melbourne, or a company called Restoration Online here, although I would avoid the Tradware brand. Lights from the US are a do at your own risk thing really, but I have not had any trouble and installed mine as is mostly. Hi Anne, I can’t remember the name of the sealer, it was just something sold at the tile shop which was in the western suburbs somewhere I found online. I think it was Marble & Ceramic Corp.
Another great read thanks to you Melinda! I am always amazed at how you are able to write and make your readers feel that they are just talking to a friend. Keep writing please!